It doesn’t take long for a mama to realize that kids—and mainly, all their stuff—take up WAY more space than you might expect. Between toys and books, highchairs and art supplies, finding calm in the logistical chaos is no easy feat. But rather than contain a child’s space to a single room, I’m always so inspired by families who embrace creative solutions with playful nooks and crannies throughout their home. Think cozy built-in benches, innovative toy storage, closets-turned nursery spaces, and more. Not only are these clever crannies fun for kids, but they help maximize every square inch of your home. So whether you’re a city family tight on space or just looking to infuse some whimsy in your current layout, design a few unexpected hideaways for the kiddos and you’ll have the coolest house on the block—guaranteed. Work around slanted ceilings with an adorable bed build right into the wall. Space dilemmas, solved! Your home’s nooks and crannies make the perfect hiding spot for toys. I love how this space cleverly disguises storage underneath a window bench. This master bedroom doubles as a nursery by converting the closet to a darling nook for baby. Add some wallpaper, shelving, a mini crib, and voila! Imagine how much fun your little ones would have crawling into a bench just their size. Toss in a few comfy pillows and you’ve got the ultimate reading spot for their imaginations to run wild. Don’t let dead space go to waste! 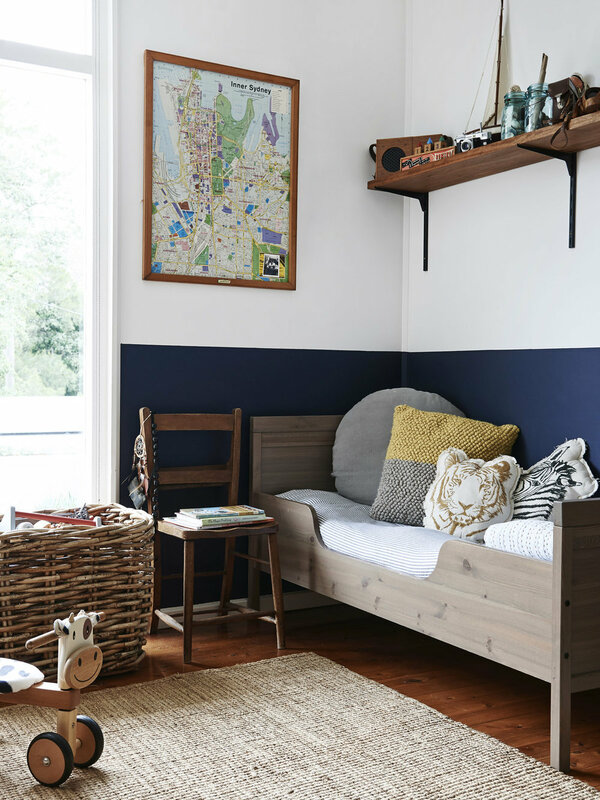 Include a playful seating nook in your child’s bedroom where they can lounge, read, or dream up their next big idea. Any specific nooks or crannies pique your interest? I’d love to hear what clever hideaways you have tucked inside your home! The idea for creating a home art space for kids came when our kitchen table started to be filled with paper, glue, pens and our kids wanted their art to stay for days. It was driving me crazy! I kept trying to clear it to one side when we ate dinner, and I finally realized that their art was more than a 15 minute activity to fill time; it was a treasure they had created as a way to express themselves and we needed more. More room, more time, more expression, more art. To be honest, it was a pretty simple solution: clean out and take over the back room of our basement which was filled with boxes and boxes of, ahem, junk. I wasn't exactly sure of where to start so I started scrolling and scrolling through Pinterest, my favourite way to escape into design heaven and I began adding all of the spaces I loved to my Kids Art Studio board. Here are some of the ideas for art spaces that I found and loved. Megan's home art studio has gone insanely viral and I can fully imagine having a playdate with her kids here. I love how friendly and inviting this space is and amazingly, she designs creative art spaces for kids through her site, The Art Pantry. Creating an art studio is an INSANE amount of work and I admire Megan for doing this for clients. I just love how the bookshelves take over the space below creating an atmosphere that I can imagine any little one whittling hours away in. I still love chalkboards, kid sized play tables and that whimsical air balloon mobile is dreamy too. I saved this space because it appears to not have windows like the actual space we have in our basement. I liked the wall shelves but still fear an earthquake in Vancouver so knew that any art needed to be secured to the wall in our art room. I think I like how busy but clean this space is, the intentional lighting and the number of seats at the table. Again...hours and hours of art could happen here! Clipboards and jars! Simple tools that work...YES!!! I mean, look how much you can store (and see!) in those jars. Yup, I definitely needed jars. The idea that I saw and KNEW I had to have was giant pegboard. Here is the inspo right here! This tutorial was helpful and the result (although a bit tricky) is so, SO amazing! As you know, I love simplicity. Ideas just don't have to be fancy (or pricey or hard!) to be so, so good. The below, a piece of rope and some wooden clothes pegs is just right for hanging kids art. I love this idea and knew we needed to use wall space a little like this to showcase special pieces. I just can't wait to share our space this week. I love these spaces and love how versatile art rooms for kids are too. You can play there, read, paint, colour, draw, build anything you can dream up. Even a tiny little art nook is just so, so worth it. Are you expecting? 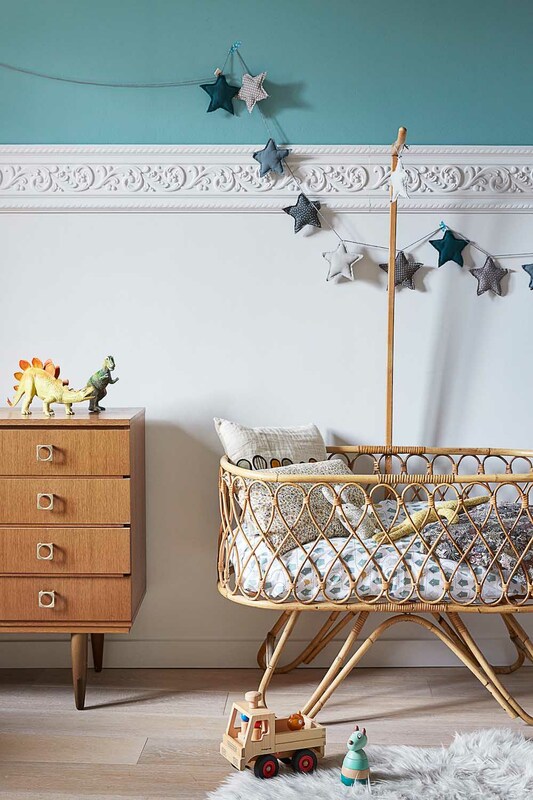 There's so much to get ready for apart from the baby's nursery, take a cue from these gorgeous baby nurseries that are totally on trend for the new year. 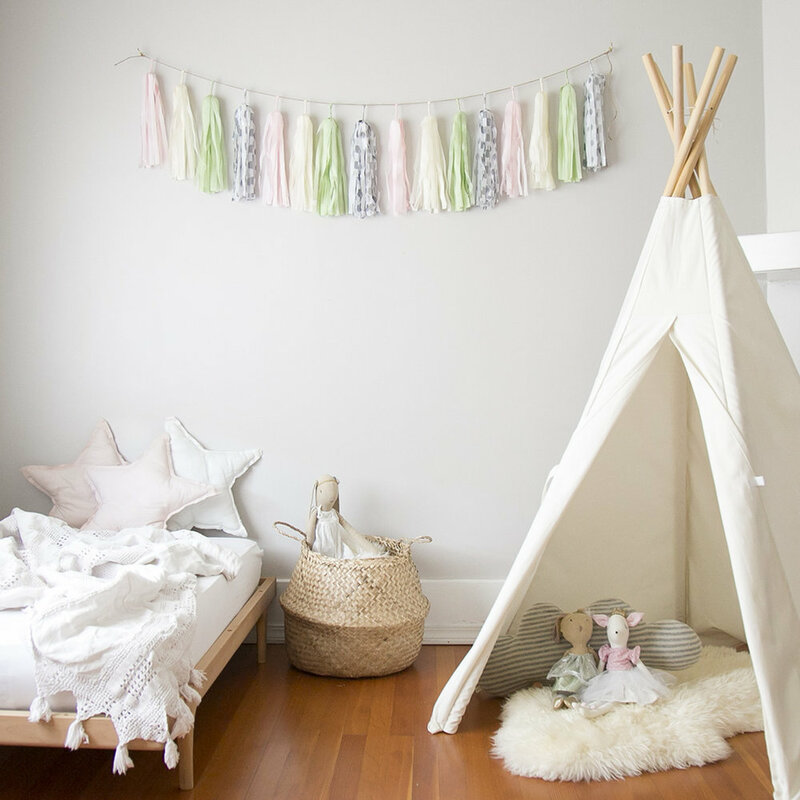 We love the use of vintage bassinets for a first baby bed and still can't get enough of THIS CANOPY! Not sure where to start? Metallic side table, extra sized art, statement wallpaper...YES! Tight on space? A baby and a toddler can live harmoniously (most of the time!) and I still love how we made it work with THIS MODERN CRIB! A special mobile above the crib is a lovely touch too. Texture and natural materials will still be going strong through 2018 and this nursery absolutely nails both! Maybe it's me, but it seems like everywhere I turn, kids rooms are being painted with a 'half wall' or 'colour blocked wall'. Although it's not entirely new, the trend seems to be growing with more and more amazing rooms created using this simple paint work. I love that it transforms a space so easily, something you could do in a weekend with such low cost. Starting off with one of my all time favourite kids rooms that feels cozy and perfectly pulled together at the same time. How dreamy are the colours? This fun and playful boys room has just the burst of colour it needs to make the wall decor, like these wall shelves pop. If you have a small wall or little nook, this trend is perfect behind a desk to carve out a special work area. Just love that globe on the shelf too! The dusty rose, mix of plywood and subtle hints of copper are a colour combination I adore. That DIY desk is everything!!! Mixing rich wood tones and this dark blue creates a room that feels vintage and modern at the same time. As you probably know, I love kids pillows and these animal ones on the bed are so cute! Love the blackboard bottom and the giant plywood letters, but that gymnastics pommel bench steals the show by bringing in such a warm and worn in vibe to the playroom that feels so unique and special. If you love this look, you can find more of this trend over on Pinterest on my Half Wall board. 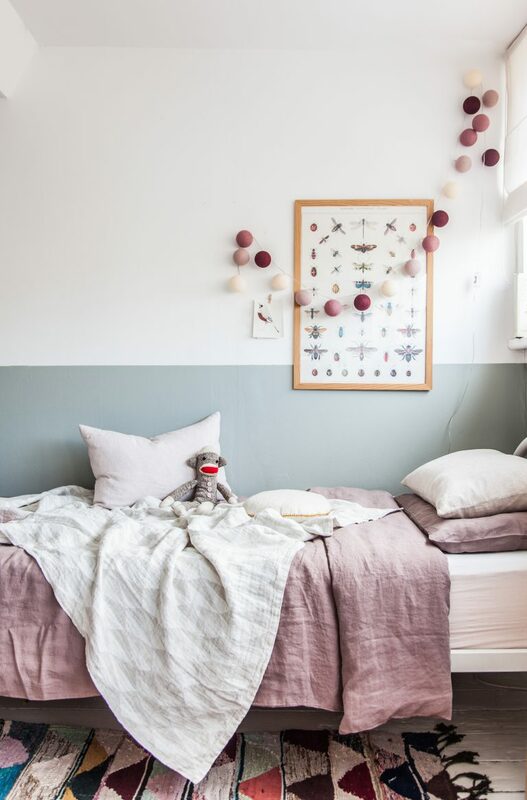 To achieve this look in your own kids' room, I recommend painting the bottom colour 40" up from floor to top of feature colour.